Among the most chronic health conditions for older adults is, of course, age-related hearing loss. Despite the high prevalence of hearing loss, use of hearing aids (HAs) is reported in only 15–20% of adults.1,2 In the past 5–10 years, an onslaught of epidemiological evidence has shed light on the fact that age-related hearing loss (ARHL) is independently and strongly associated with a variety of metrics important for healthy aging – cognitive decline, physical/mobility declines, and social isolation.3–5 These findings have led to reports to policy makers in the United States calling for increased accessibility and affordability of hearing health care for adults.6 Another interesting development is the significant improvement in recent years of consumer electronics that can provide amplification and assistive listening device functionality without the need for custom hearing aids.7,8 The current emphasis in the profession on increasing access to care coupled with the opportunity to use low-cost personal sound amplification products that provide adequate audibility for many adults creates an environment for innovative models of care. In this article, I will highlight small research studies that have delivered basic aural rehabilitation (AR) services in the community, in medical clinics, and in group care settings for older adults. Some of the models and findings presented here may be applicable to your clinical setting and serve as a guide to help you expand your practice to the majority of adults with hearing loss who we never see in the audiology clinic. While all clinicians know that evidence-based practice is the gold standard of care, finding and evaluating evidence, especially for emerging approaches to care, is difficult. In this article, I will highlight several alternative approaches to AR that seek to move services out of the audiology clinic and reach a broader range of clients who are largely underserved. Prior to sharing a few demonstrations of alternative service-delivery models, I would like to discuss the process of intervention research to shed light on the circuitous path from basic research to implementation of new clinical practices. Behavioral intervention research is an iterative and cyclical process. 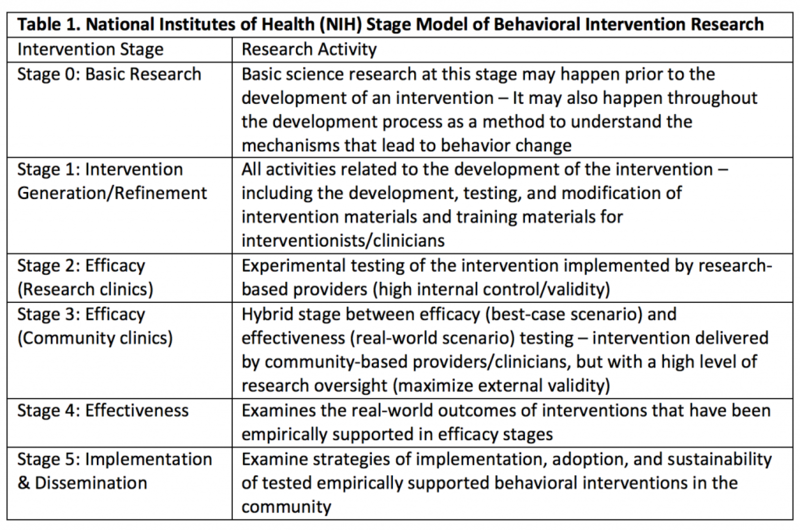 The National Institutes of Health (NIH) defines a Stage Model that includes five (non-linear) steps from Basic Research to Implementation & Dissemination (Table 1). Importantly, the Stage Model is represented as a cycle with pathways that can return to Stages 0 (i.e., Basic Research) and 1 (i.e., Intervention Generation/Refinement) after each stage of the process before reaching the final stage of Implementation & Dissemination.9. The aim of the Stage Model is an integrated translational model in which basic science questions are considered at each step of the clinical science process. The iterative development process is designed to determine not only if an intervention is effective but also why an intervention works, what the best implementation strategies are for a given intervention, and for whom the intervention and implementation strategies work best. As the field of audiology adopts a more public-health minded approach to providing treatment for ARHL, we must begin to investigate new models of care, especially novel approaches that address the needs of vulnerable, underserved populations. While the need for more affordable care is clear, other issues—such as access, stigma, awareness and understanding—must also be addressed if alternative service-delivery models are going to be capable of closing the gap between those adults with hearing loss and those receiving hearing health care.10 The following projects reflect the need to address the under-treatment of hearing loss via innovative models of care that address the unique needs of underserved populations who are currently not accessing traditional audiologic care. The Baltimore HEARS project has led to multiple spin-off projects that operate from the same behavioral intervention theory framework and target different underserved populations. Recently, a team at Baycrest Hospital adapted the HEARS program for delivery at senior centres in Toronto.13 One interesting aspect of the Toronto HEARS adaptation was the partnership between the audiologist and the communicative disorders assistant (CDA). The audiologist and CDA hosted information and screening sessions together at each participating senior centre. After screening, the CDA scheduled individual appointments and delivered the intervention on-site at the senior centres. The Toronto HEARS team also implemented the use of the Client Oriented Scale of Improvement (COSI) to enhance the customization of the AR protocol for each participant. At the three-month follow-up appointment at least 90% of the participants reported improvement in their COSI-set goals. Finally, the Toronto HEARS project was the first implementation of the HEARS program that gave participants the option to buy the amplification device or do the education component only. Only 9 of 36 participants decided to purchase a device and 7 of 36 were still using the device at the 3-month follow-up appointment. Two participants who purchased the ear-level amplification device (Sound World Solutions CS-50+) reported hearing well with it but found the non-custom fit of the device to be uncomfortable—both of these participants reported an intention to purchase HAs. Notably, despite low device uptake, participants overwhelmingly reported improvement in communication and satisfaction with the program, demonstrating that the education and counselling intervention alone was beneficial. The Memory HEARS program was offered at the Johns Hopkins Memory and Alzheimer’s Treatment Center.15 Twenty dyads (i.e., patient with dementia and family caregiver) participated. At a 1-month follow-up, 65% of participants reported using their amplification device at least 1-hour per day. Moreover, approximately 1/3 of the family caregivers reported improvement in depressive and/or neuropsychiatric symptoms for the person with dementia. While geriatricians who work with adults with dementia recognize the need to identify and manage hearing loss in these patients in order to alleviate dementia-related behavioral symptoms, they often feel that the added burden for a family to undertake an audiology referral is not worth the challenge. The Memory HEARS program created an on-site opportunity to address hearing loss and communication with minimal extra cost and burden. Adult Day Services are a common approach to provide safe and social environments for independent seniors who need some care support. The Program for All-inclusive Care for the Elderly (PACE) is a unique model of care in the United States that incorporates a Day Health Center into a comprehensive, capitated healthcare program. I have been working with PACE programs to approach the need to address hearing loss at the group level.16 For about the price of one hearing aid, we have been able to improve the acoustics of the activity hall with sound field speakers mounted throughout the room and the use of wireless microphones. In addition, we have completed an interactive sensitivity training for staff to prepare them to use headset amplifiers with PACE participants and practice good communication strategies. Finally, in pilot testing with individuals identified as having hearing loss and cognitive impairment (n=5), we measured change in engagement behaviours when using a headset amplifier.17 The next stage of development is to create a treatment protocol that addresses the most common needs across multiple PACE centers. Finally, the only project that I will highlight in this article that is not in the HEARS family, is the HearCARE program (Hearing and Communication Assistance for Resident Engagement) at the University of Pittsburgh.18 This innovative approach to managing hearing loss in a group care setting trained and placed a Communication Facilitator (CF) as a full-time employee in an assisted living residence. The CF supported use and maintenance of personal Assistive Listening Devices (ALDs) and HAs as well as personal alerting systems and common area ALDs (e.g., TV headsets and sound field speakers in the activity areas). The CF was available to troubleshoot devices and monitor/support device use on a daily basis. The CF corresponded with the supervising audiologist as needed, primarily by email. This model was more effective than the typical approach of an audiologist attending the facility once per month because it led to actual daily use of the assistive systems – both in common areas and for individuals. This model is being expanded across the senior living facilities in the University of Pittsburgh Medical Center system to include skilled nursing and independent living facilities as well. Such a model could be adapted to the role of the CDA and partnerships between audiologists and/or speech-language pathologists and long-term care facilities in Canada. Admittedly, the projects outlined in this article are in the early stages of behavioral intervention research. Nevertheless, they provide exciting new perspectives on how to approach the hearing needs of a majority of older adults who we never encounter in the clinic because they do not seek help for their hearing loss through existing models of care. These projects give credence to the idea that simple solutions are better than nothing and may, in some cases, lead to more formal acknowledgment and management of hearing loss. Making treatment of hearing loss something that can be approached by more methods than custom HAs and in more venues than the audiology clinic – community, geriatric or primary practice, group care settings – offers the chance to dramatically increase the number of adults who experience improved communication. I gratefully acknowledge my HEARS collaborators across the various projects. I also gratefully acknowledge Marilyn Reed, Kate Dupuis, and Catherine Palmer for kindly contributing comments to this article. Chien W. and Lin FR. Prevalence of hearing aid use among older adults in the United States. Arch Intern Med 2012;172(3):292–3. Bainbridge KE and Ramachandran V. Hearing aid use among older U.S. adults; the national health and nutrition examination survey, 2005-2006 and 2009-2010. Ear Hear 2014;35(3):289–94. Lin FR, Yaffe K, Xia J et al. Hearing loss and cognitive decline in older adults. JAMA Intern Med 2013;173(4):293–9. Chen DS, Betz J, Yaffe K et al. Association of hearing impairment with declines in physical functioning and the risk of disability in older adults. J Gerontol A Biol Sci Med Sci 2015;70(5):654–61. Mick P, Kawachi I, and Lin FR. The association between hearing loss and social isolation in older adults. Otolaryngol Head Neck Surg 2014;150(3):378–84. Goman AM and Lin FR. Hearing loss in older adults - From epidemiological insights to national initiatives. Hear Res 2018. Reed NS, Betz J, Kendig N, et al. Personal sound amplification products vs a conventional hearing aid for speech understanding in noise. JAMA 2017;318(1):89–90. Reed NS, Betz J, Lin FR, et al. Pilot electroacoustic analyses of a sample of direct-to-consumer amplification products. Otol Neurotol 2017;38(6):804–808. Onken LS, Carroll KM, Shoham V, et al. Reenvisioning clinical science: unifying the discipline to improve the public health. Clin Psychol Sci 2014;2(1):22–34. National Academies of Sciences. Medicine, Hearing Health Care for Adults: Priorities for Improving Access and Affordability, ed. D.G. Blazer, S. Domnitz, and C.T. Liverman. Washington, DC: The National Academies Press; 2016. Nieman CL, Marrone N, Mamo SK, et al. The Baltimore HEARS Pilot Study: An affordable, accessible, community-delivered hearing care intervention. Gerontologist. 2017;57(6):1173–86. Suen JJ, Crowder S, Madison A, et al. Baltimore HEARS pilot: A community health worker-delivered hearing care intervention, in American Auditory Society. Scottsdale, AZ; 2018. Reed M. Toronto HEARS: A new service delivery model for seniors with untreated hearing loss, in Canadian Academy of Audiology Conference: Ottawa, ON; 2017. Madani M, Taylor V, Espinoza S, et al. Hearing screening in a VA Memory Clinic, in American Geriatrics Society. San Antonio, TX; 2017. Mamo SK, Nirmalasari O, Niemen CL, et al. Hearing care intervention for persons with dementia: a pilot study. Am J Geriatr Psychiatr 2017;25(1):91–101. Mamo SK, Mayhew SJ, Nirmalasari O, et al. Age-related hearing loss and communication at a PACE Day Health Center. J Am Med Dir Assoc 2018;19(5):458–59. Mamo SK, McNabny MK, Oh E, et al. Improving hearing and communication for individuals with dementia in a group care setting, in AudiologyNOW! 2017. Indianapolis, IN; 2017. Palmer CV, Mulla R, Derva E, and Coyan CK, et al. HearCARE: Hearing and Communication Assistance for Resident Engagement. Semin Hear 2017;38(2):184–97. Sara K. Mamo is an assistant professor in the Department of Communication Disorders at the University of Massachusetts Amherst. Her research focuses on improving the accessibility and affordability of hearing healthcare for older adults. She has a particular interest in addressing the accessibility of hearing care for individuals with hearing loss and dementia.